A lyrical essay in photographs paired with text, from the author of Open City. The point here is not the exotic but its opposite: mysteries of the ordinary, attained in patiently awaited, brief flashes. In other words, this is a book about human culture ... The images are populated with human life, but for the most part that life is implicit: with a notable, climactic exception, there are few faces. These choices are deeply purposeful. The abstaining, in texts and photographs, is ardent ... This questioning, tentative habit of mind, with its allegiance to particulars, suspending judgment while hoping for the brief, limited miracle of insight, drives Cole’s enterprise. 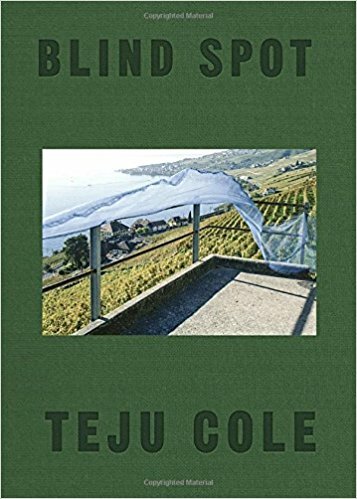 Blind Spot features the same quality of Cole’s luminous prose, but if his earlier works, including his PEN/Hemingway-winning debut novel Open City, favored longer sentences flavored with Proustian digression, the writing here is tighter, more condensed. Like the images, the writing here is often dramatically cropped, offering fragments in lieu of extended arguments and reveries ... Blind Spot uses the interplay of visual information and textual information, creating connective threads that span the individual locations, multiplying their resonances ... Teju Cole has succeeded in shredding experience into tiny fragments, all of which add up to much more than the sum of their parts. Reading any one of his books is like stumbling upon the exposed tip of a massive underground landmass, one that he’s spent the better part of a decade mapping but the entirety of which he has yet to image ... This book eschews argument in favor of a tender enfolding. In this sense, it’s a culmination of a style and a set of ideas he’s been honing since his novel Open City ... The effect is like realizing that what you thought were stray notes cohere into song when you listen across a long enough interval. These repetitions teach us how to think along with Cole by calling our attention to details that might seem easy to ignore ... The effect is a delirious sense of second sight. Cole brings the unseen realm of poetry into vision, exposing a reality that’s not beneath the surface so much as caught in its interstices. What did you think of Blind Spot?